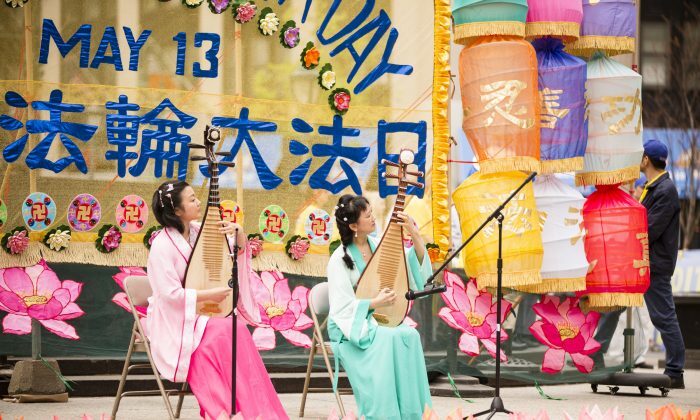 NEW YORK—The performers who gathered in Manhattan’s Foley Square on Wednesday to celebrate World Falun Dafa Day say their artistry owes much to the meditation practice they share. Falun Dafa, also called Falun Gong, is a spiritual discipline that was introduced to the public by Mr. Li Hongzhi in China 23 years ago on Wednesday. While Falun Dafa has its roots in China, it has spread around the world, a fact reflected in the diversity of the performances on Wednesday. There were elements of traditional Chinese culture like the dragon dance, a Pipa (Chinese lute) duo, classical Chinese dancers, as well as more contemporary western performances like western folk, pop, and classical music. For Vivian Ge, a professional pipa player, performing on Falun Dafa Day was about sharing the goodness of Falun Dafa with others. “Because she picked up the Falun Gong practice, she is more peaceful all the time,” said her translator, adding that this has rubbed off on her playing. In addition to the five sets of meditative exercises, Falun Gong has moral teachings for everyday life that one performer said has helped her with her classical Chinese dance. Mika Hale, who sang a mix of folk and pop music, said that her voice changed when she started practicing Falun Dafa, and not just because she gave up drinking and smoking. In 1999, former Chinese Communist Party head Jiang Zemin started a violent persecution of the practice that continues to this day. “We’re here to show that Falun Dafa is extremely beautiful and, in the face of persecution for 16 years, we’re defying the persecution,” said one of the organizers, David Tompkins, at a press conference for World Falun Dafa Day on Tuesday. World Falun Dafa Day has been celebrated each year since 2000, and in New York, it involves almost a week of activities. “It’s a commemoration of a really memorable practice that really changed my life,” said Hermann Rohr, a Falun Dafa practitioner at Foley Square. Falun Dafa celebrations last until Friday, climaxing in a grand parade that starts at the United Nations and ends at the Chinese consulate.